Seattle, WA, July 2, 2018 — To truly know Europe is to have gone beyond its boulevards and museums and to have explored its archipelagos, skirted its coasts and island-hopped its seas. The 2019 Europe program of Windstar Cruises has many options for discerning travelers to do just that, with itineraries ranging from the old-world Baltic region to craggy Iceland to the idyllic islands of the Mediterranean, and the line is adding six brand-new cruises to its robust 2019 European collection of sailings offering 163 unique ports of call. The line is also touting a whopping 26 Star Collector Voyages for Europe 2019. These journeys range from 14 to 51 days and include free laundry to help lighten the packing load, the most comprehensive sailing being the 51-day Grand Mediterranean on the world’s largest sailing ship. Booking is now open for Europe 2019 with itineraries starting at $2,399 per guest. The small ships of Windstar Cruises are able to call at ports like Edinburgh, Cork and Harlingen where large cruise ships cannot go; docking in the heart of St. Petersburg and Venice allows Windstar guests greater freedom to explore at will, which is especially valuable on the overnight and late-night port calls that are included in nearly half of Windstar itineraries. There is simply no better way to connect to the magic, mystery and majesty of a world discovered and propelled by great ocean exploration than by small ship. In the Mediterranean, six new itineraries will debut in 2019 giving travelers enhanced options for experiencing the Mediterranean and Adriatic in-depth, and several itineraries will once again transit the Corinth Canal that divides the Peloponnese from the Greek mainland. Wind Surf, one of the world’s largest commercial sailing ships and boasting an extensive Watersports Platform, will also return to the region next season, perfect for the active-adventure-history-buff. Voyaging from Barcelona to Athens aboard the majestic sailing ship Wind Surf is the ultimate way to explore the Mediterranean. This cruise from Athens to Venice aboard Wind Surf travels between two of the great seafaring cities of history. This epic Iberian cruise aboard Star Breeze is an intimate exploration of Portugal, Morocco, Gibraltar and Spain, fertile soil for Picasso, Dali, Cervantes, and the imaginative flights of culturally curious travelers. An overnight stay in Seville allows extra time to dive into the intricacies of the Alcázar Palace and savor the local tapas and nightlife. Athens and Rome were the great capitals of Western Civilization with far-reaching influence on development. This exploration aboard Star Prideretraces ancient trade routes for an adventure that incorporates ancient history, dramatic ruins and the modern cultures and cuisines that have grown up on these islands. 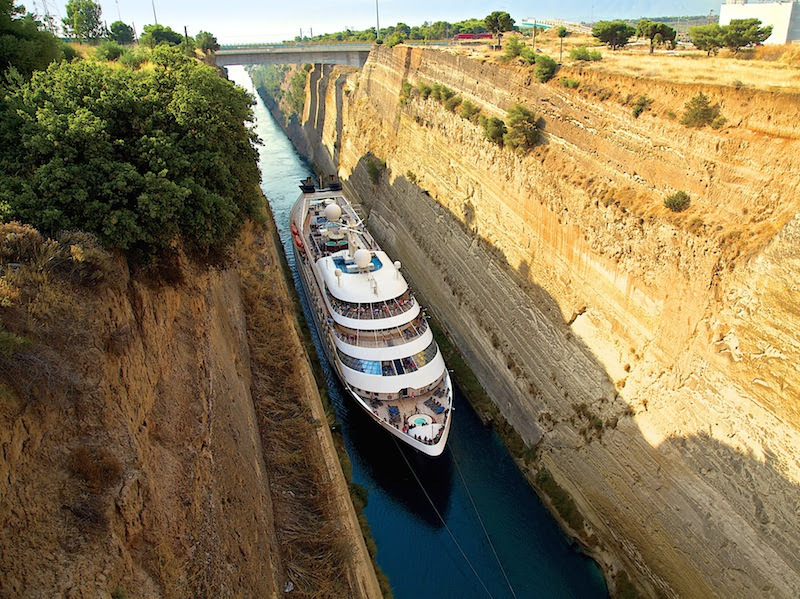 The narrow, steep-walled Corinth Canal was an engineering feat 2,000 years in the making, but is now a shortcut for small ships like Star Pride. This voyage aboard Star Pride is the Mediterranean route less traveled as the ship makes its way from Venice to Athens by way of Slovenia, Croatia, and Montenegro, with the Corinth Canal transporting Star Pride to Athens. This encyclopedic exploration of the Med combines the new Barcelona to Athens and Athens to Venice itineraries on Wind Surf plus much more as it makes its way from Iberia, around Italy, down the Adriatic, through the Greek Isles to the western coast of Turkey and back. This extended itinerary allows ample time not only to see one of the most amazing regions in the world, but to take full advantage of the immersive and enriching experiences that are part of the Windstar difference. And with the luxury of time, taking advantage of the water sports, fitness center and spa pampering is assured. This is a trip worthy of being called once-in-a-lifetime. This Athens to Athens voyage aboard Wind Star(two sailings) and Wind Surf (one sail date) is an opportunity to island-hop across some of the most mythical and important sites in world history, combined with opportunities to engage in water activities where the great and the gods once roamed. This Athens to Athens itinerary also offers Windstar guests the unique opportunity to see these legendary islands up close, from aboard Wind Starsailing ship, a graceful, thoughtful way to navigate history. Star Pride will also sail this itinerary once in 2019. This Rome to Rome cruise aboard Star Pride is a glittering tour of the most glamorous ports, specially planned with the Monaco Grand Prix at its heart. If there is a bucket-list trip for Formula One aficionados, this is it. Windstar will continue to offer itineraries to some of the most popular destinations in Northern Europe sailing through fjords, weaving through ancient archipelagos and visiting cities of the Old World that appear as if from a fairy tale, including a new experience on Europe’s Atlantic. One new itinerary is added to these summer sojourns that are all bathed in the magical light that has inspired tall tales and legends across centuries. The great explorers of history dared to sail to the edge of the world, today many travelers do not even explore to the edge of Western Europe. This adventure from Lisbon to Amsterdam or Portsmouth to Lisbon aboard Star Breeze, takes guests along the fringe of the Atlantic to touch upon sites typical tourists miss. This circumnavigation from Reykjavik to Reykjavik aboard Star Breeze takes guests on an intimate exploration of this one-of-a-kind island. An additional sail date in 2019 means more opportunities for booking this incredibly popular itinerary. This journey from Copenhagen to Reykjavik or Reykjavik to Edinburgh aboard Star Breeze now takes guests through the Faroe, Shetland and Orkney Islands to see the islands of the Atlantic from the perspective of the ancient Vikings. Star Collector Voyages combine some of the most popular Windstar itineraries to create epic voyages and in-depth exploration of each region. Sailing for 13+ days with few repeated ports, it is an exciting way to discover the world and only unpack once. Free laundry is a thoughtful amenity that allows guests to pack light; Windstar also offers 10 percent off pre-booked beverage packages. There are 26 Star Collector Voyages available in Europe in 2019, allowing travelers to match their deepest passions to just the right in-depth journey, ranging from 14 to 51 days. The true value of Star Collector Voyages is clear when considering multi-week journeys like the 51-day Grand Mediterranean, highlighted above. To learn more about authentic small ship cruising with Windstar in Europe or elsewhere around the globe, contact a travel professional or Windstar Cruises by phone at 877-958-7718, or visit www.windstarcruises.com. Αναρτήθηκε από geop στις 10:12 π.μ.